Through trial and error, the Water Rocket Hydroponics Club at Buckeye Valley Middle School has learned to adjust the pH level of the Root Spa. Katie Mampe adds pH Down to lower the balance using a pipette to add a little at a time so she doesn’t overcorrect the level. Keera Clinger checks the pH level of the Root Spa with a digital monitor. Katie Mampe (front) and Julienne Williams (back) lift one of the tomato plants out of the Root Spa to show how long the roots have become in a short time. 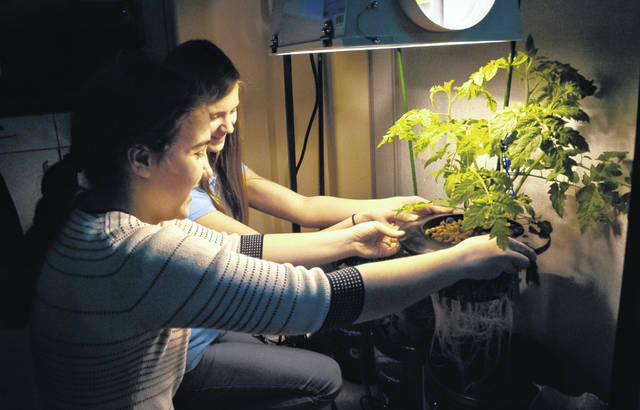 A small group of Buckeye Valley Middle School eighth-grade science students has become successful hydroponic farmers growing tomatoes, lettuce, basil, cilantro, cucumbers, and herbs in the classroom. 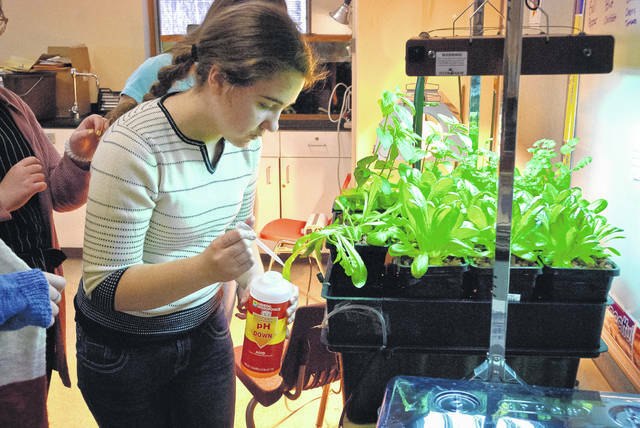 The 12-member club, the Water Rocket Hydroponics Club, received a grant totaling nearly $1,000 from the Delaware General Health District to start the small classroom garden. “As educators, we’re supposed to challenge our advanced students,” said Jill Johnson, eight-grade science teacher. She added the garden has been a wonderful challenge. The hydroponics system was purchased from Hygrowponics, 3914 Brown Park Drive, Hillard, who sent a team of experts to help set it up. Students said with the help from the professionals, they had the system up and running in three hours. 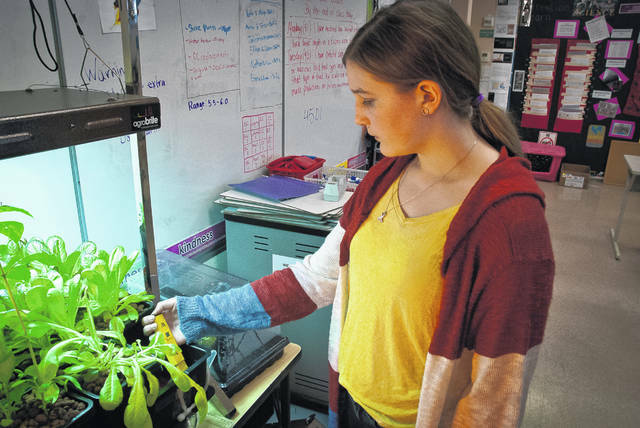 “We decided on the best plants that had the most probable chance of sprouting,” said eighth-grader Keera Clinger. The students said some of the plants came as sprouts growing in “rock wool cubes.” They also received some seeds they had to start themselves. Upon returning to the school last week following spring, the group was astonished by how much the plants had grown while they were gone. Some of them joked that the greatest advantage to a hydroponic garden is no weeds to pull, and the only tool needed is a pipette. The hydroponic system is constructed from five-gallon buckets and a tub that are full of water acting as “root spas,” baskets full of clay pebbles that the plants are planted in, and air circulation pumps to keep the water moving to prevent algae buildup. The students need to watch the pH balance closely and adjusted it whenever it’s too high or too low. They said the pH balance has to be held between 5.5 and 6, which they have learned how to adjust through the method of trial and error. “We’re all getting the hang of it,” Jones said. The club holds weekly meetings to check the progress of the garden to divvy up the week’s responsibilities. Every week, the roots spas have to be dumped and replenished to prevent chemical and dirt buildup. “They have developed their own individual systems on how to make it work,” Johnson said. The plants have matured to the point that students are picking some of the herbs to eat. At the end of the school year, the club plans to hold a salad party using the fresh ingredients from the hydroponic garden. Since all of the club members will be freshmen at the high school next year, they want to pass the garden and club onto the seventh-graders so the club’s legacy can last well into the future. “We’re going to teach the seventh-graders, because we want the club to go on for many years,” eighth-grader Emma Meier said. This entry was tagged Buckeye Valley Middle School, D. Anthony Botkin, Hydroponics Club, Jill Johnson, Julienne Williams, Keera Clinger. Bookmark the permalink.